The Russian government has just allocated 50 million rubles ($1.52 million) for the development of a technical proposal to land a probe on the surface of Jupiter's largest moon, Ganymede. If successful, it would mark the country's first mission beyond Mars. This is actually quite exciting! Ganymede makes for a really cool target. It's the largest moon in the solar system — about 8% larger than Mercury, but has only 45% of its mass. It's primarily composed of silicate rock and water ice, and it's thought to contain a saltwater ocean about 125 miles (200 km) below the surface sandwiched between layers of ice. It's also the only moon in the solar system to possess a magnetosphere, likely created through convection within its liquid iron core. The proposed Russian mission, called Laplas-P, would feature two spacecraft launched by a pair of heavy launch vehicles. The journey to Jupiter would take about seven to nine years. The Russian government is hoping to develop the technical proposal by the end of 2015. The 4,000-kilogram Laplas-P1 spacecraft would feature an orbital module, OM, and a main propulsion system, MDU. Laplas-P2 spacecraft would consist of an MDU propulsion system and a 950-kilogram landing vehicle, PA. Following the Laplas-P1, it would first enter orbit around Ganymede and then dispatch the PA lander onto the moon's surface. The lander will deliver around 50 kilograms of scientific instruments on Ganymede's surface for a year-long studies. Both spacecraft will have an operational life time lasting from 11 to 13 years, including three years allocated for a pre-launch processing. Realistically, prototypes wouldn't be developed until about 2017, and the rockets wouldn't be launched until 2023. 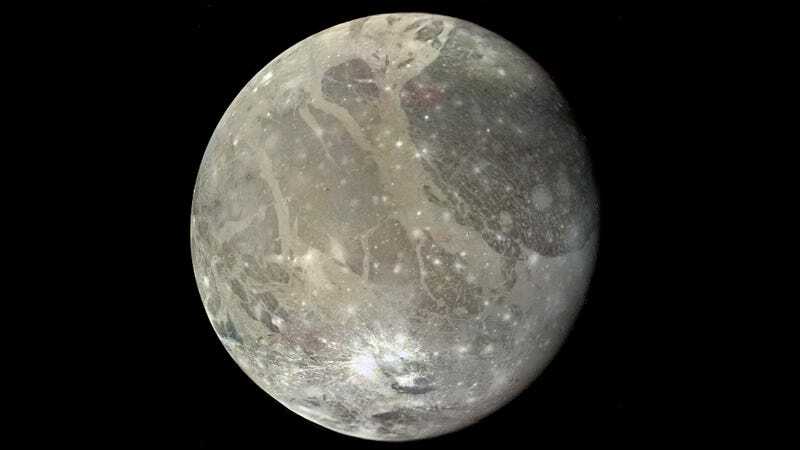 So we're looking at an arrival time at Ganymede around 2030. Much, much more here — including the complex history behind the project, which was once slated as a mission to Europa.